A good friend has been telling me about the Franklin Cafe for years. “They have The Best mixed drinks and The Best mussels” he raves. They’re also a tiny beat off the beaten path on Shawmut Ave in the South End, which I like, and they don’t even have a real sign outside – just an art deco martini glass emblem. Everything about the Franklin appeals to me on paper, yet it has taken me a decade to get there. 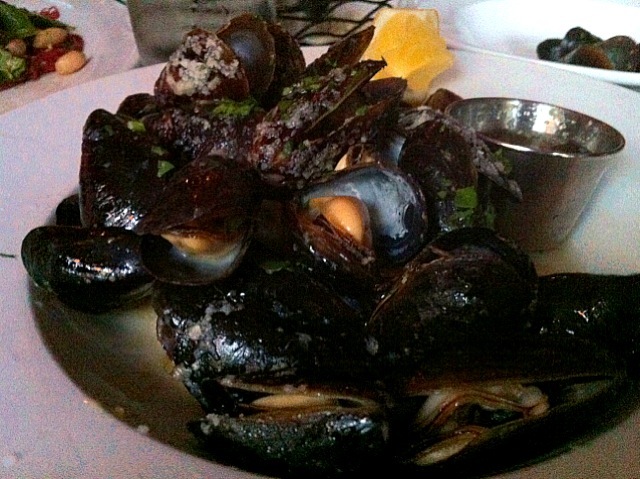 And even though I was skeptical of “The Best” mussels, they trump anything I’ve had in a long, long time. The Franklin isn’t a dive, but it’s not ultra trendy and sleek. The scant booths and tables are a little chipped, but the worn wooden bar is the place to camp out for hours – you can watch the customers squeeze themselves into the tiny unisex bathrooms. Before 7pm the clientele (on a Wednesday night) was primarily women in for an early dinner, but once 7:30 hit the place was packed with hipsters, locals, and the whole rainbow connection. It was awesome. We started with The Best mixed drinks, Spiced Pear Martini and Cucumber Collins. The Collins tasted a little more like watermelon than cucumber to me, but it was still fantastic – a great drink for a hot summer day. The martini was delicate and not overly sweet, something you could crave in the fall. The Saigon Style Beef Carpaccio, served with ginger lime sauce, pickled peanuts, and fresh mint, was The Best beef carpaccio I have ever had. I would have called it The Most Unique, but that makes it seem like I appreciate its off-beat nature but didn’t really like it, which is not the case. I would never have described a plate of beef as “refreshing,” before this, but that’s exactly what it was. And finally, The Best Mussels. The menu describes them as Smokey Skillet Roasted Mussels with warm clarified butter and parsley. I would describe them as shamefully delicious, as I found myself actually licking the shells for every last bit of flavor. They were Amazing. The Franklin is not ideal for big parties, any more than four for a booth or table just wouldn’t work in its small space – though the bar is another story. I will be back asap for mussels, carpaccio, and anything else I can cram down my gullet. Count this as one of my new favorites.